Mladiinfo: Can you first describe how did you come up with the idea for a “smart hotel” and what makes Hotel Schani Wien different from other hotels in Vienna? Hotel Schani: We wanted to create something unique with Hotel Schani Wien, a hotel that did not exist in this form and that would surprise and offer novel things. We deliberately chose to oppose conventions and took a step into the future. We were able to include guest requests during the development phase thanks to our cooperation with the Fraunhofer IAO and the FutureHotel guest survey and we will continue to watch out for upcoming developments. As a SMART Hotel, we develop innovative solutions to save time-consuming administration. In our view, our mobile check-in should save guests valuable time. They can book their desired room from home or on-the-go and decide immediately on extra features and the view they prefer. They receive all the information on rooms available via an app and are notified as soon as the room they have booked is ready. This avoids unpleasant delays, while the smartphone room key gives them additional independence. These innovations make reservations less complicated and leave the hotel staff with more time to focus on guests’ individual requests. They have more time for personal service and can take over more concierge-like duties, usually known only at luxury hotels. We offer our guests various options with our mobile services, which they can, but do not have to use. That is what makes us a smart hotel. Mladiinfo: Hotel Schani Wien is described as one with personalized style. Can you be more specific and pick one or two elements that make Hotel Schani being characterised like this? Hotel Schani: On one hand, Hotel Schani Wien combines traditional and modern Viennese culture and tells stories about the past times and times up ahead. We integrated unique Viennese items in the architecture and created an individual modern design. First of all, you will see the typical Viennese Thonet weave pattern adorning the hotel’s facade – a reminder of grandma’s rocking chair and, then, you can explore Vienna in every other corner of the lobby or the rooms. Artist Oskar Kubinecz also created some Viennese flair with his drawings of the Schani and Vienna, guiding you through the hotel, telling Viennese tales. We keep the Viennese “Charme” alive, so guests can feel which city they have just arrived in as soon as they walk into the lobby of our hotel. On the other hand, we take more time for the individual needs of our guests, as we do not have to focus on administration work. We can pay more attention to the person, conversations and give insider tips, so guests are able to explore the real Vienna. Mladiinfo: Your “living room” should be a room that help people to connect. How does this work in practice? How do you facilitate or encourage human connection here? Hotel Schani: In Schani´s living room, we have created a multi-functional space, where diverse tasks such as work, communication, recuperation and dining can form synergies. Therefore, we offer different corners to relax, talk to friends or do business. The easy-going atmosphere and connected tables bring people together, as they feel more comfortable talking to the person right next to themselves. Conversations are just as possible as working. So, we integrated a fully-fledged coworking space right into the lobby, which is intended for locals and hotel guests alike and, thus, is a hub for local and global cooperation. We offer a separate area containing single work places and separate conference rooms, but with still enough space to network and talk to others, or relax with a nice glass of wine. We create networks and offer regular coworking events to strengthen community building. Mladiinfo: By your opinion, what type of travellers would feel most like at home at Schani Hotel, and on the contrary, what type of travellers would prefer a standard hotel? Hotel Schani: Hotel Schani Wien is a trendsetting hotel and strives to appeal to modern travelers from all over the world. Our target group loves travelling and wants to experience the local spirit in every single way, even in the hotel. They are looking for something individual, not expensive, but still with style and the right style — a place where they can enjoy their trip, but have enough space and privacy to do some work, too. They hate time consuming processes that hinder their travel plans as they want to be flexible, spontaneous and independent during their stay. They depend on their mobile phones and use them for booking and research, as well as everything else. Although they want booking processes to be fast, high-tech and independent, they are looking for social contact with others, either those are locals or business partners. Those who are looking for the typical standards may be better visiting a chain hotel with a minibar, telephone and safe in each room – a hotel where they can expect the same value no matter which city they are visiting. Mladiinfo: What is that young people and travelers appreciate the most about your services? Hotel Schani: Young travellers are used to choose their destinations, locations and flights individually. They appreciate the service of the online check-ins at the airport, choose their preferred seat on the airplane, enjoy apps with important information and use their mobile phone all the time and for everything possible. They are used to technology and independence. That is why we have already integrated smart services in our Hotel Schani Wien. We were one of the first hotels to offer individual room selection, mobile check-in and the smartphone as a room key. Guests appreciate our services, choose their room on our website, use the Schani App for checking in and opening the door and get excited about the function Mirror Screening on our Smart TVs, as they can look at their holiday pictures or check their presentations for work. In addition, not only do we offer business corners, but we have also integrated a coworking space into the lobby, where not only guests, but locals can work at their own desks. In Hotel Schani Wien, we follow the principles of coworking: openness, accessibility, community, sustainability and collaboration. People can work, communicate, enjoy themselves and sleep here. Young people are looking for excitement – they need surprises and are looking for a special design for a fair price. Mladiinfo: What kind of activities do you offer to your guests to enjoy and relax during their stay in your Hotel? Hotel Schani: We have created a “green oasis”, right in the middle of the city at Hotel Schani Wien, where guests can reinvigorate themselves. A good cup of tea and Mother Nature will almost always help you wind down. You can access Schani’s Garden directly from the lobby. However, this is not your average English garden, but a wild garden in which you can experience the scenery. Get some inspiration and motivation for your work or simply enjoy a moment of deceleration in the garden. 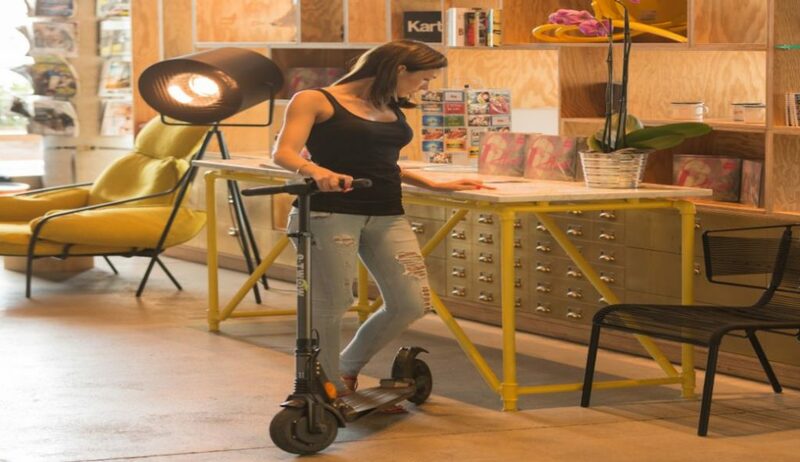 If you need more action, just rent our skateboards or scooters and explore the city from a different perspective. This way you are outside and have the chance to know other places in addition to the tourist attractions. Mladiinfo: Can one organize his/her own activities or events at your Hotel? Or what else can be done at Schani? Hotel Schani: You can plan your events, take part in our events or just drop by to celebrate with your friends at Hotel Schani Wien. We adapt to the individual requests of our guests and try to make almost any request a reality. Our lobby provides space for events of up to 400 people, including a DJ, speeches or a cosy get-together. The seminar room offers a more private atmosphere. This room can be used for events of up to 100 people. It is often booked for holding seminars and workshops. Hotel Schani Wien has space for any kind of event; just tell us what you are looking for and we will prepare a tailor-made offer. Your event with character, seasoned with Viennese charm.